I’m running out of steam. It’s been a difficult month, and for everyone whose blogs I’m falling behind on reading and commenting on, I have to apologize. It’s been a bit frustrating to post on a regular basis, but I really love doing it. With that said, let’s jump right into today’s topic. Today’s topic is all about stalling. By stalling, you should gather that I mean I’m slowing down on editing, to the degree that I haven’t done anything since last week. The reason for that? Busyness. So I have to ask myself: do I really want to edit this novel I’ve written? And is it worth all the effort when I’m busy with my housework and submitting resumes and whatnot? The answer to both those questions is a loud and clear yes. And why is that? Well, I think it’s mostly due to my dad. Yesterday we went to a cheap bookstore that moved into an old Linens-n-Things shop. I don’t even know how long this Book Gallery is going to be there, but all the books are between 50 and 70 percent off their regular prices. That’s a pretty sweet deal considering. My dad and I went off on our own, looking at different books. But the one amazing thing about my father is his capacity for supporting my dreams. Where other members of my family have told me I can’t do things that I want to, my father has always encouraged me to go after what I want. He got my attention and drew me to the back wall of the massive bookstore. On a few tables back there, he found a section of writing handbooks. Now Dad doesn’t necessarily know what I’m looking for in terms of writing books, but he did recognize at least one book on my list. What was it? The 2010 Writer’s Market. Originally $30 at Borders, he found the book hiding in the back corner of the Book Gallery for $11. Why do I tell you all this and what does it have to do with editing? I’ve been tired, frustrated, and haven’t wanted to edit in a few weeks. But I learned something about myself last night. Having someone who supports me looking out for my interests is enough to make me want to find time to edit. The fantastic thing about NaNoWriMo is the sense of community you get while writing madly towards that 50,000 word goal. When November’s over and your manuscript is sitting on the hard drive gathering electronic dust, it’s difficult to muster the enthusiasm to edit. It’s not to say I don’t enjoy the editing; I actually do, but it’s hard to motivate myself to edit something that I waver on believing in sometimes. But my dad believes in me. And right now, that’s enough for me. My stalling is over, and I have a manuscript to edit. In fact, I should be editing now. So I’m going to get back on that and keep going till I’ve finished my first edit. I think that’ll be motivation enough to complete the second edit. What about you? Have you found yourself stalling in edits? How do you break through the edit blocks? Let me know! It’s time for your favorite and mine: Wednesday edits. Wednesday Edits is a series of posts for those aspiring authors who wish to share their tips and tricks of the self-editing trade. I invite anyone who wants to pick up the series on their own blogs to snag the button and link back to this page. In addition, please let me know by commenting on this blog if you pick up the button for use, and provide a link to the specific post. I’ll put a list of rules up later. For now, the gist is simple: on Wednesdays, you will be writing about editing. Post stories, tips, and other editing-themed items, and let the rest of the world read your thoughts on self-editing–anything from novels to school essays. Moving right along, then – here is my bit to contribute for today. Editing a novel is slow, tedious work. I’m finding that out now, and it’s one of the more interesting things I’ve discovered. I’m not even halfway through the first read-through and basic edit, and I don’t know when I’ll get there. But I am trying. So far I’ve learned that my editing technique is pretty simple. 2. Use Scrivener’s annotation function to annotate red-pen notes to myself about continuity or excessive scenes/paragraphs that need rewriting and fixing in later drafts. 3. Catch grammatical errors, misspellings, and unclear sentences during the read-through. Fix those as I go. Pretty simple, eh? It sounds easy enough, and it’s been a delight to reread my writing since it’s been such a long time since I wrote those first chapters. I’d forgotten a lot of what I wrote, and rereading is always good for me. So I have a question for you: do you tend to hate what you wrote when you reread it? Or are you on the opposite end of the spectrum – do you love your writing? I’m curious because most of what I’ve read in the NaNoWriMo forums talks about hating the editing process mainly because the authors dislike their writing. Personally I’m enjoying every minute of my reread. Even the parts that need editing are a delight because I get to pick and choose what would work better, how to rework the sentences, and what should be rewritten in its place. At the same time, though, I honestly hate to edit my writing this way. I may be the most biased self-editor ever. I love my writing to death and hate changing any of it, unless of course it’s a misplaced word or grammatical error. But shortening, tightening, losing some of the verbiage? That’s akin to blasphemy. So to conclude this little ditty, I have one piece of advice. 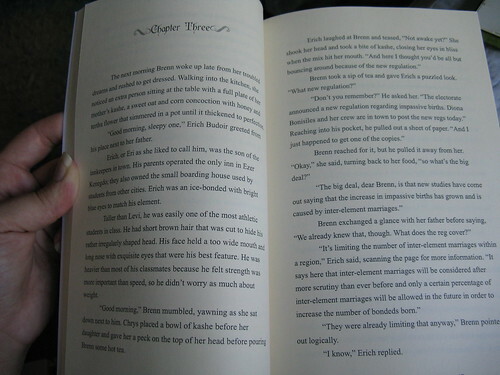 Editing Tip # 707: If you’re editing something a bit smaller than a novel-sized work, consider using this tip from my old high school English teacher: Instead of reading over your work from beginning to end, start at the end and read up to the beginning. This keeps you from reading what you meant to write instead of what you did write by forcing you to read it differently. It works well in two ways. First, it allows you to catch grammatical errors from sentence to sentence. Second, it helps you make everything cohesive. If the last sentence and the sentence above it don’t allow for clarity and understanding, you might want to work on rewriting. I’ve used this technique especially well on college essays. It helps me catch problem areas every time. I haven’t tried it on my novel. If I do, I’ll wait till after I do the rewrites and do a scene at a time. It might drive me batty, but I’ll see if it works. That’s my tip for the day. You can take it or leave it, but it’s a fun one to do in practice. Have you ever tried reading one of your college essays from end to beginning? Can you have too many characters in a novel? So I’ve been working on editing my novel, and it’s understandably slow-going. (Though I admit to suffering severe laziness lately!) I’m still doing my first read-through, but one of the big things I’ll be picking up after this read-through is character consistency. I titled it that because I’m not sure if there’s another “proper” term for it. So I’ll define it for you. So that’s where my question originates. After looking at a few of my favorite series of fantasy novels, I have to wonder how difficult it’s going to be for me to keep my characters consistent. 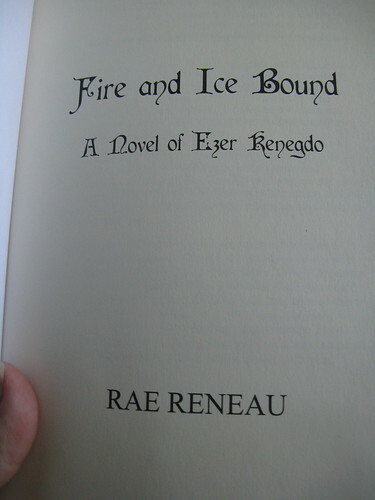 I plan to eventually write the sequel to Fire and Ice Bound, and it will no doubt add more characters to the mix that will need good, solid descriptions and backgrounds to enrich this world I’m creating. I decided for comparison’s sake to look into two well-known series. First, let’s consider Tolkien’s The Lord of the Rings. I am no Tolkien. He was a true master of the craft, having created Middle-earth, all its various creatures, the languages spoken by different races, and the specific characters who give the world and the plot life and breath. The fellowship of the ring numbers 9 characters: Frodo, Samwise, Gandalf, Aragorn, Legolas, Gimli, Pippin, Merry, and Boromir. By the end of the first book, they number 8 and have split up, but the following two books tell the entire fellowship’s story in detail, following each group (with the exception of Gandalf) in their own travels. If you look up the Wikipedia page for LOTR character pages, you’ll see that there are 64 different characters listed, all with separate Wiki pages. I can’t claim that Wiki’s correct (and no one will dispute that Wiki’s accuracy sometimes leaves something to be desired), but I scrolled through the page, and there are a number of characters listed that I remembered from the books, including those who didn’t make the movie version. I’d be willing to guess that this is an incomplete list as I don’t remember everything from the books. But just consider that Tolkien wrote in parts for at least 64 different characters, all with appearances, backgrounds, abilities, and other minutiae he must have had to dream up. Even if he didn’t write in their stories, Tolkien created such a rich tapestry that it seems impossible for him not to have at least dreamed up the backgrounds for such characters as the various hobbits (the Bolgers, Brandybucks, Tooks, and Proudfoots “Proudfeet!”). Okay, so moving right along, let’s look at another fantasy series since I am by no means epic like Tolkien. I got to looking at C.S. Lewis’s Chronicles of Narnia as well. The Wiki article covers characters from all seven of the books, so there’s a large number of characters mentioned. Just looking at the page, though, I’m a little overwhelmed by how many characters were introduced in this children’s series. Lewis’s most endearing and enduring characters are characters like Lucy Pevensie, Mr. Tumnus, Reepicheep, and others. And they have very different personalities. Where Lucy is curious and brave, Mr. Tumnus is nervous and watchful, and Reepicheep is brash and excitable. Perhaps one of the more interesting aspects of Lewis’s series is how much you see the children change. Yes, I know they don’t all feature in each book, but it’s the mystery of Narnia that Lucy and Edmund can continue into Narnia after Prince Caspian but Peter and Susan cannot. How many characters is that? Six characters of a whole host of them featured in the stories. I ask myself how these two incredibly talented writers could create such richly tapestried worlds with varying cultures, peoples, and plots. It seems a great deal of work to me. And then I look at my own story. 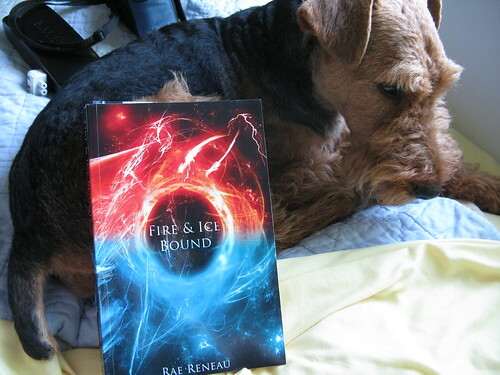 Fire and Ice Bound follows the story of 14 students. That’s enough to give me a headache, especially if I weren’t focusing on just one as the main character. But I have to give each student a description, skills, abilities, background, and a myriad of other items to make them come alive. And I’ve fallen in love with each of the students I’ve written. Of course, these 14 students aren’t the only characters in the story. So I have all my characters listed in the profiles sheet, including parents, extras, and others. And many of these characters haven’t even appeared in my novel in any way. But they’re all listed because they have their various parts to play. At present, I have 35 characters listed in my document, but it hasn’t been updated since I wrote it at the beginning of November 2009. In short, my second revision will include quite a bit of shuffling of characters, fixing those who change elements mid-story, bringing blue eyes back to brown where necessary, finding personality flaws that should be brought into more prominence, and making them more lively in what ways that I can. Anybody else think I’ve overdone it? What about you? Have you written stories with multiple characters like this? How do you deal with a story that has a large amount of characters? It’s been an incredibly busy day. I’ll make a short post. Wednesdays are hopefully going to be my days to update you on the editing progress this month and tell you all the fun things I’m working through on my manuscript for Fire and Ice Bound. With that said, I’ll start by explaining how I want my first read-through to go. I’ve already read through the prologue and the first chapter. I may or may not ditch the prologue after the advice Orson Scott Card gives in his how to book. I haven’t decided yet. My first read-through, for better or for worse, is simply going to be a grammar check. The only reason for that is I know myself too well. If I reread what I’ve written, I’ll go nuts every time I find a comma splice or misspelling. So I’m reading critically for grammar first. But I almost forgot to mention my program! As a NaNoWriMo winner, I had the opportunity to cash in on some great winner offers. Obviously the one most NaNo-ers care about is the free proof copy from CreateSpace, and I definitely plan to use my coupon and get my proof copy once my manuscript passes inspection. However, there’s another awesome offer that a select number of NaNo-ers were able to cash in on this year as well. I say select because it really depends on what type of operating system you use. Anyone using an Apple was able to cash in on this offer, and it’s pretty fabulous. The NaNo winners were able to purchase Scrivener at a 50% discount from the cover price. Scrivener is a word processor, but it’s not just a word processor. It was created with writers in mind, specifically writers of longer pieces of fiction, like novels. Scrivener allows you to do some really awesome things: combine all your story documents into one giant file, use the corkboard to move and manipulate the order of your story, divide each chapter into scenes, edit, use the full-screen mode for minimal distractions while writing, and so much more. It’s a pretty intriguing program, and I’m just now exploring it through editing Fire and Ice Bound and writing The Macchiato Murders and Tales from Lucy, but there are a lot of things I’ve yet to figure out. It has everything from a standard novel manuscript form to a tutorial to scriptwriting features, and it’s pretty simple to operate. So I’ve imported all my chapters from the NaNovel into Scrivener and have read through the prologue and first chapter, making minor wording changes and a few rewrites or deletes. It’s not great, and it needs a lot of sculpting and shaping to make it work, but it’ll be worth it. This is the beginning of my editing process, and I know everyone edits differently, so what’s your starting point? A brisk read-through to get a feel for the whole story? Chapter by chapter or scene by scene revisions? Let me know! I’d love to hear tips and tricks from the pros (or the not-so-pros as the case may be). I Am Not Editing – Really! I got enough sleep last night after all the craziness of the last few days. It was glorious. And it was so lovely to wake up and realize I’d overslept my alarm for the umpteenth time. I suppose getting a job would cure me of that failing or else that failing would cure me of a job. Either way, I feel rested today. So I thought it would be a good idea to read a bit more of How To Write Science Fiction & Fantasy while I was awake and able to process it. So far I’m really enjoying the book, but it’s also been rather challenging. That’s both good and bad for me. Having Orson Scott Card’s take on this area of fiction has been rather invaluable for me. I finished reading the chapter on world creation today and am currently reading the story construction chapter. It’s fascinating because there are so many facets that need to be considered in order to write a well-rounded, thoroughly planned, adequately articulated novel. Granted, a lot of those are things that become subconscious, like deciding your genre and then adding in elements that are typical to that genre in order to fit with the conventions. But there are a lot of questions this book is raising for my own story. For example, I have to wonder if my world is really developed yet. Do I have an organized system of government for my country? Is the magic involved fully scientific and fully ‘magical’ at the same time? Does it make sense? Are their articulated rules on how the magic works? My answers to each of those questions are the same. Yes and no. Card’s challenge to think through these expectations of readers is really causing me to want to get into the nitty-gritty development of my world regardless of the story I’ve written. I want to go back and pin down all the variables that make up even the details of the world that will never be written into a story. It’s kind of exciting and kind of exhausting at the same time. But I’m thinking it’s a good idea to begin working on some of those extra details now while I have the opportunity and before I begin editing that first draft. That’ll make it easier for me when I go back to identify the areas that need to be explored, fleshed out, and detailed. Or nixed altogether. And, despite the fact this book was written for authors of science fiction and fantasy, I think it can provide guidance for writers of any genre. Just check out the third chapter on story construction. Card begins with a discussion of the distinctions between ‘heroes,’ main characters, and point of view characters and throws out ideas for just how those characters can be the same and different depending on the story. Perhaps this is a plug for the book, but I’m enjoying it. In fact, I’ll probably go back to reading it some more after I finish this. But it’s beneficial, challenging, and thought-provoking in all the best ways. So I’m going to stick with it. I’ve been wanting to make this title for a post ever since I first thought about getting out some writing-related books to read. Of course, I had to hold off until I officially started reading one of said books, and that wasn’t until after I have purchased one of said books. Confused yet? So am I. Anyway, I’m currently in the middle of a reading spree of books that might possibly help me in editing my novel in March. I have no idea whether they’ll be of great help or not, but I’m going to try them and see. I’m looking forward to some of them; others are pleasure reads that I can finish shortly and move onto the next book. So my pleasure read at the moment is Fusion Fire by Kathy Tyers. 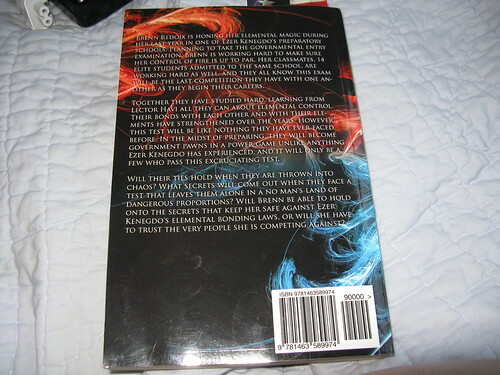 Again this is the second book in the Firebird Trilogy. It’s a good book so far, and since I’d already started reading it, I’m picking it up where I stopped reading. It’s not that hard to get back into, and I hope I’ll finish it soon. As far as writing-related books go, I’m reading Orson Scott Card’s How To Write Science Fiction & Fantasy after purchasing it the other night with my dad. So far it’s had more emphasis on writing sci-fi, which I can understand given Card’s background. (Though he has written for both genres.) However, he offers a lot of insight on world creation and other elements. It’s a five chapter, short book, but it’s making me think a lot about my own world. What is it that makes it a fantasy? What is it that could stand more rules and structure? What requires a bit more development? These are all questions I’m thinking about as I read Card’s book. I like his style. So far I’ve been pretty impressed, and now I’m kind of wanting to read Ender’s Game and Hart’s Hope as he mentions both those novels in the book. He uses them as examples for his world creation process. I’ve never read any of his novels before, but I’m thinking once things settle down and I’ve shaved off more of my reading list, I’ll invest in a few of his novels and see how he writes fiction. At this point in the game, I’m pretty sure he’ll impress. But I’m going to have to end this little post because it’s been a crazy, hectic day, and I have quite a bit to do. I have a choir rehearsal for a concert in less than thirty minutes, am trying to speed up the bake time on tamale pie, and need to get my contacts out because they’re bugging me. Oh, and I went to the home and garden fair today with my dad. It was really lovely, and I managed to purchase some seeds to start an herb garden. I also got two planters: one has lavender that you sow yourself, and the other has peppermint that’s getting ready to sprout. I’m rather excited about it myself. I got thyme, basil, and Italian parsley seeds as well. We’ll see how it works! Comments? Thoughts? Snide remarks? Let me know! This has been a rather lazy day. It’s now a little before 7:30, and I’m just getting around to posting for the day. On a side note, anyone who can tell me how to get the blasted time stamp feature changed on my WordPress account would be very helpful as it’s now saying I’m saving the draft at 12:23 a.m. Even so, I don’t have a lot to say today. I’ve been reading all Lauren Willig all the time, but I’m considering a slight change of pace after I finish reading the current novel. After thinking about it, I’ve realized I should probably prepare myself for the first round of editing before I get into it. So I’m going to pick up some of the books on my list that rank closer to the world of fantasy. Next on my list to be read? I’ll be finishing off Kathy Tyers’s Firebird trilogy. It’s sci-fi, but the technical aspects of it will be helpful because I seriously need to bone up on my technology descriptions. I’ve read Firebird and started reading Fusion Fire several months ago. For what it’s worth, this series has held my interest in a way few sci-fi series do. And I’ll be honest, I couldn’t stand C.S. Lewis’s space trilogy, consisting of Out of the Silent Planet, Perelandra, and That Hideous Strength. I tried to read the series, but it was just too foreign to me. Perhaps I was too young; I think I first started reading it in middle school. Either way, the sci-fi did not work for me. And I’m a Lewis fan through and through. With that said, I like Tyers’s world. It’s an odd combination of sci-fi and fantasy because the two genres can easily be said to be intertwined. I don’t care as much about the science of her world because I’m not scientifically minded. If it didn’t make sense, or, as my dad says, if the physics didn’t add up, I most likely wouldn’t notice. But I’m perfectly at ease examining her development of characters and gradual drawing of relationships. The plot helps, too, of course. However, I’m pretty sure I’m going to make this series the last I read in the sci-fi genre. Why? The science bores me. If I have to read about how spaceships fly or the genetic qualities of a particular space gem necessary for survival on four-fifths of a galaxy’s planets, I’m going to fall asleep. Yes, sci-fi can be well done. Yes, I’m sure it’s very interesting once you bypass all the nitty-gritty details. I’ll be perfectly happy to allow everyone’s opinions, but for myself, the next time I pick up a sci-fi book, I’d find it just as enjoyable to skip over the monotonous details and simply read for the plot. What is everyone else planning to read next?